The adaptation of Gene Roddenberry’s Star Trek, has replaced everything we know about the original series from being able to create a whole range of new narratives, when the Romulan Nero from the future comes to the present killing Christopher Kirk and un-ravelling a whole list of new possibilities and adventures that J.J. Abrams has work hard to produce in ‘Star Trek’ and ‘Star Trek Into Darkness’. 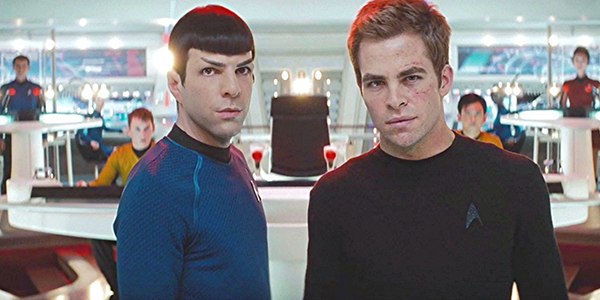 The new ‘Star Trek’ franchise stars Christopher Pine, know for the Princess diaries. Instead of the original cast containing William Shatner as the heartthrob James Kirk. The new era has allowed a new set of fans to enjoy the classic TV show as it was all those years ago. The first movie in the new ‘Star Trek’ follows young Jim Kirk finding his way into more trouble then the average teen, and giving in all he had to join the Starfleet academy. And along with his attitude problem and his colleges or friends depending who they were; Dr Maccoy or Bones and Spock and a range of other colourful characters, helped him get out of and into scrapes fighting the Romulan Nero, saving the crew and becoming captain of the Enterprise and then into the new film. The second movie to me was a lot more complicated than the first. Although the narrative seems simple at first with Khan trying to take over, saving his own crew that had become part of weaponry onboard the Enterprise and taking down Starfleet for revenge allowing his race of super humans to take over. There is more than meets the eye. For example the threat of Khan was classed under terrorism, which at the time this film was in production in 2012/2013 terrorism was a known cause of panic and still is today. Perhaps giving a message that America and the world will not stand for this to happen. Even in the end of the film where Khan crashes the ship into the main buildings it looks like a reenactment of the 9/11 bombings in New York. Giving a constant remembrance to all those that lost their lives and those that fought hard to save on that horrific day. It was a fantastic piece of production that always keeps my mind and respect for that day and all of those lives. There was a lot of special effects throughout both movies including the use of solar flares which in my opinion gave you in the audience the general affect of being among the stars and in space. Feeling like you where among the action taking places. Although I will say there might have been an overuse of solar flare within scenes that didn’t need it. The speed of the editing was well adjusted, fast enough to keep up with the action and slow when dialogue was taking place. The one criticism I have for the film was the lighting, because at certain scenes when the scene took you to a set that was dark it was hard to see what was actually going on. There are rumours that there will be a third movie in the rebooted Star Trek franchise, in 2016. Hopefully it will be as good as the last two and find ways to get the trekkis back in force.